This website is dedicated to Bernard and Ruth Wallwork and all their ancestors and descendants. PLEASE NOTE:- If you wish to share any images/research from my website either contact me or post an acknowledgement link to my website. I am all in favour of preserving and sharing our local history. It is therefore not my intention to infringe anyone else's copyrights. The photographs here reproduced are those of six sons of Mr. Hy. Wallwork, 5 Back Mount Pleasant, off Swinton Hall-rd, Swinton, five of whom have joined Kitcheners Army. The two who lived at home are Joseph and George, the names and addresses of the other three, who are married, being Harry Wallwork, 174 Partington-lane, Swinton: John whose home is at Carlton-place, Swinton, and Walter, who lived at 56 Bridge-st, Pendlebury. Joseph has joined the Royal Irish Regiment and is in training at Longford, Ireland, whilst the other four are all in the second company of the Swinton, Pendlebury and Clifton Pals, and went in training at Penmaenmawr on Saturday. Mr Wallwork is a collier working at Agecroft and three of the five sons followed the same occupation prior to enlisting. The boy Wilfred, who appears in the group, is a member of the St. Mary's Company, Catholic Boys Brigade, Swinton. John James Wallwork was born in 1884 in Swinton. He was the 1st son of Henry and Emily Wallwork. He was on the battle field in the Albert Trenches on the 12th November 1915. John James was sent to Deippe from the causality clearing station where he became an Officers Staff mess cook. He was transported to Liverpool on the 2nd November 1918 and after serving 3 years for his country John James was discharged on 11th November 1918.
they lived at Charlton Place in Park Street Swinton, and had 7 children. John, Doris, Martha, Joseph, Kathleen, Phyllis, Gladys. Walter Charles Wallwork was born in 1886 in Swinton. He was the 2nd son of Henry and Emily Wallwork. Walter fell fighting on the Somme on 1st July 1916. An official message has been received by Mrs Wallwork, 4 Maude St., Pendlebury, to say that her husband, Pte. Walter C. Wallwork, is reported missing since the first day of the advance. He is one of five brothers who are serving with the colours, whose photographs appeared in the "Journal" last year. He joined the Lancashire Fusiliers in March last year, and went to France nine months later. Having carried on the business of hairdresser before enlisting, he plied his trade whilst in training with his company. He was at one time employed at the Clifton Hall Colliery. One of his brothers has written home to say that Pte. Wallwork was badly wounded. He is 31 years of age and married, and was home on furlough about two months ago. Pte. Walter C. Wallwork, 4, Maude St., Pendlebury, who has been reported missing since July 1st, is now officially presumed to have been killed on that date. Writing to Wallwork’s wife, the Army Council state: "We have been regretfully constrained to conclude that he is dead, and that his death took place on July 1st, 1916, or since." Deceased is one of five brothers who joined the Colours, one of whom is still among the reported missing. He joined the Lancashire Fusiliers in March, 1915, and was drafted to France about nine months later. At one time he carried on business as a hairdresser in Bridge St., and acted as Company barber whilst in training. 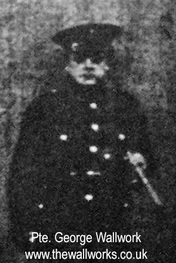 He had previously been employed at the Clifton Hall Colliery. At the time deceased was reported missing one of his brothers wrote to say that he had been badly wounded. He was 31 years of age, and leaves a widow and three young children. "He died the noblest death a man may die, Fighting for God and right, and liberty." Harry Wallwork was born in 1890 in Swinton. He was the 3rd son of Henry and Emily Wallwork. 19th (Service) Battalion Lancashire Fusiliers. Lance-Corporal Harry Wallwork, of 174 Partington Lane, Swinton, has been missing since July 30th. An official message to that effect has been received by his wife. He is the second of five soldier brothers to be reported missing. Mrs Wallwork has also received a letter from a comrade of her husband, in which he states that Lance-Corpl. Wallwork was killed by his side, death being almost instantaneous. The writer was himself wounded shortly afterwards. An inquiry was addressed to the officer of the company, but he has been unable to give further information. Wallwork enlisted in the Lancashire Fusiliers at the Swinton Public Hall early last year, and went to France in November. In the battle of July 1st he was wounded, and for the next three or four weeks was in hospital at Rouen and Boulogne. He was transferred eventually to the King’s Liverpool Regiment but the first day he went into action with them he failed to answer the roll call. He is 26 years of age, and married, with a wife and three children. Before enlisting he was employed as a miner at the Sandhole Colliery, Linnyshaw. along with the Saint Mary's church memorial Swinton. they lived in Partington Lane, Swinton. Joseph was born on the 6th December 1895 at Back Mount Pleasant, Swinton. He was the 4th son of Henry and Emily Wallwork. Joseph was in the Royal Irish Regiment, he presumably joined this to impress his future wife Betsy Hannah Rourke and her family. Joseph's theatre of war was 2.B. Balkans which means that he was sent to Gallipoli. The Royal Irish Regiment was with the 29th brigade in the 10th division which was a pioneer battalion. They sailed from Liverpool on 7th July 1915 and landed at Suvla Bay about 7th August 1915. By October 1915 the battalion was withdrawn and redeployed to Salonika, then onto Alexandria Egypt. By September 1917 the battalion was sent to France where it remained until the end of the war. Whilst serving in the Royal Irish Regiment Joseph was bayoneted, gased and captured as a prisoner of war towards the end of the war. The effects of these traumatic events remained with him the rest of his life. Joseph married Betsy Hannah Rourke on 17th July 1920 at The Church of St Mary of the Immaculate Conception. They had 4 children, three boys one girl who sadly died at the age of 10 months. They lived in Moorside Road, Swinton, Manchester. Joseph died at home in the arms of his youngest son Leo on 19th October 1949 aged 53 years. Bernard, Eric Joseph, Winifride, Leo. George Wallwork was born 27th December 1897 in Swinton. He was the 5th son of Henry and Emily Wallwork. where he was in the Albert trenches. George was married in 1920 to Ellen Thomas and they had 5 children. Twins George and Joyce (died in infancy), Jean died aged 14, Nora and Brenda. ​Swinton & Pendlebury, Clifton, Worsley, City Of Salford and over th' border.